As an early stage start-up with a new focus on medication management, there were many challenges ahead of Cureatr. When new CEO Richard Resnick and new Marketing Communications and Automation Manager Jake Benhke (recently promoted to Director of Marketing) joined the team in 2018, Cureatr’s website had not been updated and there had not been any new content launched in a couple of years. Historically, the primary source for new leads was referrals from existing clients. The sales team was also working to grow existing accounts as health systems expanded. However, as current clients were solidified, it became clear that they needed a way to bring in new leads as well as a system for nurturing those leads into new business. This realization and the launch of their innovative medication management solution, Meds 360, necessitated a greater focus on marketing efforts. They needed a marketing plan and a new website that would clearly communicate their message as well as capture leads in order to convert them into customers. Prior to Behnke joining the Cureatr team, there had not been a dedicated marketing role so he was starting at square one. Understanding the challenge and many parts that had to be put into place, Behnke knew he would need a partner to help execute and implement a successful marketing strategy and website. Behnke was asked to research and pick an agency. Cureatr was using the HubSpot platform for marketing and sales, so a HubSpot Agency Partner was essential. A huge plus would be a partner that had niche healthcare IT experience and compatible work philosophies. Due to his past relationship with Spot On in his previous role at another healthcare tech company, he knew Spot On fit the bill. From the beginning I knew I wanted to work with an agency that felt like an extension of the company and worked more as a partner than simply as a vendor. I needed a team I knew would be attentive, available, and dependable; and above all else, a team that I could count on to move quickly and deliver results. Once the decision was made to work with Spot On, the wheels were quickly set in motion to put together a solution that included several phases for Cureatr’s overall marketing strategy. The agency’s team began with persona interviews, key team member interviews, keyword research, and competitive analysis. Spot On used the target audience as the foundation for Cureatr’s strategy. This ensured that messaging, brand platforms, website copy, planned content, and any other assets kept this audience and their pain points in mind and that the content strategy was mapped to the persona buying cycle. One major step in the partnership was a complete website redesign. The goal was to have the new site launched within three months. Spot On created a detailed timeline and set up tasks for all responsible parties in their project management system. This ensured a seamless process that enabled all deadlines to be met on time. Behind the scenes, Spot On developed a URL mapping plan for the new site and drafted page titles and meta descriptions according to best practices for search engine optimization. Finalized designs were modified for mobile before development began to guarantee an optimal user experience at any screen size. Before launch, the agency ran extensive quality and assurance tests and crosschecked the site on all major browsers and platforms. Once the new website was live, Spot On and Cureatr worked closely to keep up with a busy content schedule to develop thought leadership for the company. This meant putting together a content calendar, while also preparing and publishing several blog posts per week. In addition, several content offers were put together quickly, including eBooks, infographics, and more. Since Cureatr wasn’t focused on active marketing prior to partnering with Spot On, there were some immediate results from the marketing strategy put into place. For example, landing pages now work properly and send notifications to a team member to let them know a contact downloaded a piece of content. Prospects are also able to book appointments directly with the sales team or live chat with a team member if they have questions. With a comprehensive long-term strategy, results do take a bit longer. 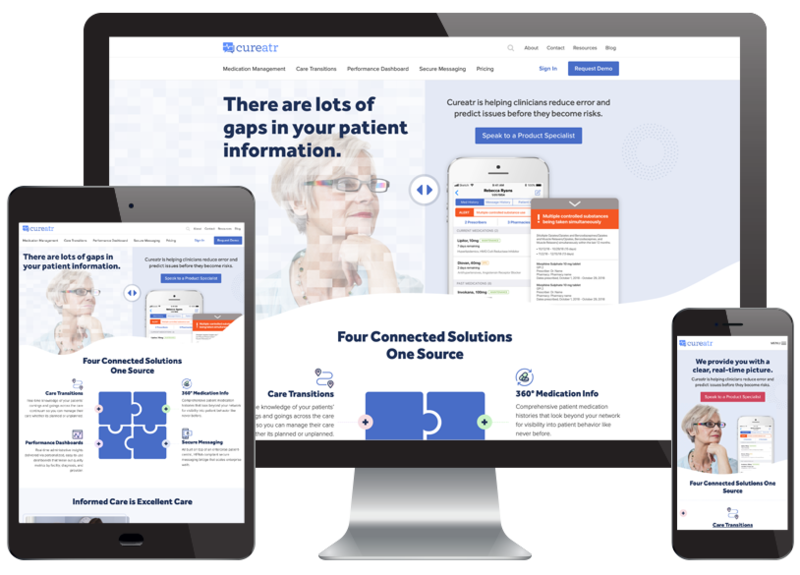 Initially, Cureatr worked with Spot On to work toward driving the right traffic to the website by building thought leadership through relevant content that spoke to the pain points of their audience. Several months later, the effort is paying off and the results speak for themselves. People who don’t work in marketing often expect that you can bring in a marketing manager and agency and immediately see overnight results, which is never the case. Spot On did a great job of executing on strategy and we’re now seeing those results: the increased traffic, conversion rates, and sales qualified leads. I’ve worked with a lot of third parties and some have been great, others not so great. The best ones proactively managed our relationship and were in constant communication with me, all of which has been true with Spot On. I know I can always reach someone through text, Slack, or a phone call. Above all else, you need an agency that can adapt with you. For example, with website tweaks, a bigger agency might not be as equipped to handle or might not be able to put changes into place right away. Ultimately, it’s important to find an agency that’s dependable and good to work with, which Spot On is. Schedule a consultation with one of our inbound marketing experts.